This weekend, I ran a one-on-one ice climbing instruction course with Zheng Yang, an aspiring alpine climber and one smart cookie (he was in the military as an explosives expert and is now a mathematics major at Columbia). It was a great weekend for the ice here in the park, and it was great to have some one-on-one time to really hone in on Zheng Yang's ice technique. Here's some photos from the weekend. (Note that they are thumbnails. Click on the pictures for the expanded files). Enjoy! The auspicious entrance ice sculpture to the ice park. Quite fitting, really. Getting some practice on the steep WI 4's in the South Park. Working steep technique. This stuff gets hard! It's almost like a little chimney with a roof on top. Techy, pumpy, and really great climbing! Warming up on a mellow flow. If you look closely, you'll find there is something a bit... strange about this particular climbing session (for the answer, see next photo and caption). footwork and using the available holds to your advantage. And it sure doesn't make you pumped! A beautiful steep gully climb. To the left, there is a rope hanging on Le Saucisson, a great intro to steep mixed climbng (M6). Next to it is Chinese Water Torture. At M9, it is a testpiece at its grade and a project for many Ouray locals. 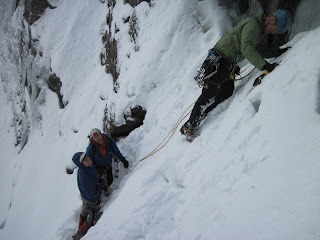 Clipping bolts is the name of the mixed game in the Ouray Ice Park. After the first powder dump of the month. The storm hit the area with up to 24" of light powder. Oh yeah, the skiing in the Ouray area is awesome, too! The memorial to Karen McNeill and Sue Nott, two beloved climbers who passed while climbing in Alaska. The memorial graces the entry to the Ice Park's upper bridge area. The plaque to the memorial. Seconding some snow-covered ice. When there is a lot of snow on top of the ice, it takes extra effort to excavate the good sticks. While tedious at times, it is an excellent mountain skill (or, in many cases, a front country skill, too). Steeper lines usually do not collect as much snow as moderate lines like this, because the angle of the ice sheds snow better. Diggin' the ice! Nothin but smiles on the last day of the course. Notice the good form! Thanks for looking. It was a great weekend of climbing in the prime season of ice climbing in Ouray. Stay tuned to the blog for more updates on the ice season, as well as various climbing techniques to hone your ice climbing game. Climb on! February and March The Forest Service is offering Snowshoe Hikes and Cross Country Ski Tours for all ages. Scroll down to find one in your area and make your arrangements. by cash or check made out to Discover Your Northwest Interpretive Association. Feb. 4, 18, 19, 25, 11 a.m.
Meet at upper Mt. Baker Ski Area parking lot by the Bagley Lakes Trailhead. Learn about area history, winter ecosystem, wildlife and safety. Snowshoe Hannegan Road Feb. 11, 11 a.m.
Meet at the Shuksan Picnic Area at the base of the Hannegan Road, milepost 46.5 off the Mt. Baker Highway, SR 542. Make reservations Jan. 8-Feb. 26 at Skykomish Ranger District, 360-677-2414. Trips for special events and school groups can also be scheduled. Sultan Shuttle offers transportation from Sultan to the resort. Check http://www.stevenspass.com/Stevens/the-mountain/sultan-shuttle.aspx for fees and schedules. Sat. Sun. 11:30 a.m. and 2 p.m. Learn about the history of the area, the winter ecosystem and wildlife on this beginning walk. No reservations are necessary. Participants must have intermediate ski skills. Meet at Grand Junction on the Nordic ski trail out of Summit East Ski area at 10:30 a.m. The program is free, but participants will need a ski area trail pass to access Grand Junction. For more information call 425-434-6111 or 425-434-7669. Learn about the history of the area, the winter ecosystem and wildlife. The 90-minute walk and extended snowshoe trips run Jan. 8-March 31, the winter photography and ecology outings Jan. 21-March 31 and the “Kids in the Snow” program Feb. 4-March 31. Make reservations at 425-434-6111. Trips for special events and school groups can also be scheduled. Meet 15 minutes early at the visitor’s center off I-90, exit 52 on Snoqualmie Pass. Sat. Sun. 10 a.m., 11:30 a.m., 1 p.m. Learn about winter ecosystem, wildlife and safety. Fri. Sat. Sun. 9:30 a.m. Experience Commonwealth Basin in the winter surrounded by the Cascade crest peaks. Jan. 21, Feb. 4, 18, March 3, 17, 31, 9:30 a.m.-2 p.m. Capture winter nature on film while learning about ecology. Feb. 4-March 31, Sat. 1 p.m. Earn a Junior Ranger Snow badge! Learn about tracking, crawl into a snow cave and check out a snow crystal with a magnifier. Here's a great video about someone who truly loves the world of climbing. Someone who calls a camper his home, and his back yard is Indian Creek. To have you own Moab climbing experience, be sure to check out our Guided Climbing Trips in Moab! With the crazy weather we've had here in the PNW, we've been getting hit with dumptruck loads of snow. Here's a local vid showcasing the great snow we've been getting. As an added bonus, you get some quick and easy cooking tips thrown in there! Bon appétit! Well, that's two videos of guys living in their trucks. Unfortunately I couldn't find a third of the same caliber, so how about something tasty from the good folks at Salomon and their latest from a trip up to our neighbors in the north. And lastly, here's a highlight from the UAII Ice Climbing World Cup in Saas Fee, Switzerland. Pretty sweet! One of the most overlooked techniques in avalanche rescue is how one shovels. This is the most time consuming part of any avalanche rescue. The following video was put together by Backcountry Access, a company that develops avalanche beacons, shovels, probes and backpacks. Start downhill of the probe strike. Make the hole approximately a wingspan wide. Begin shoveling 1.5 times the burial depth downhill. Save energy by shoveling snow to the sides of the pit. Once you have dug down to a point where the snow surface is above your waste, begin to shovel the snow downhill. Attempt to get at the victim's face as soon as possible. When you get to the victim, uncover the head and chest and establish an airway. Only leave the scene for help if there is a surplus of manpower or the victim has been excavated. In a shallow burial (less than 1 meter) start shoveling just downhill of the probe. In deeper burials one rescuer should start just downhill of the probe. The second rescuer should start to dig downhill 1.5 times the burial depth. Rescuers should shovel snow to the sides until the hole is waist deep. Once it becomes necessary to lift snow above your waist, then start shoveling the snow downhill. If the victim is unconscious when you reach him, the first thing that you should do is to clear the airway and begin CPR. This element of an avalanche rescue is often overlooked. But it is an extremely important part of rescue process and should be practiced alongside the use of a beacon and a probe. • Two VIP Passes to the Annual Dinner. The VIP reception, overlooking Boston Harbor, is an intimate gathering of North America’s most accomplished climbers and mountaineers. The guest list includes Jack Tackle, Tom Hornbein, Janet Bergman, John Bragg, Jimmy Surette, and more. • Ice Axe signed in person by the Saser Kangri II team. Freddie Wilkinson, Mark Richey, and Steve Swenson—the evening’s keynote presenters—recently summited the world’s second-highest unclimbed mountain and will sign a special axe to the winner. • $100 toward the Silent Auction, which includes climbing art, one-of-a-kind trips, and gear packages from The North Face, Mountain Hardwear, and Outdoor Research. Every person who buys a ticket to the 2012 Annual Benefit Dinner by February 6th automatically will be entered to win this giveaway package! The Annual Benefit Dinner is the AAC’s signature and largest annual event. In addition to fine dining and entertainment, the Dinner mingles climbers of all generations and abilities to celebrate the vibrant state of this 110-year-old organization. The event will be held in Boston at the Seaport Hotel and will celebrate a year of change and success through the theme of Partnership: Climbing through the Generations. Following dinner, Boston native Mark Richey (age 53) and climbing partners Freddie Wilkinson (age 32) and Steve Swenson (age 57) will share inspiration from their August 2011 Saser Kangri II expedition. They reached the 7,518-meter summit of the second-highest unclimbed mountain in the world—one of the last frontiers of Himalayan climbing. • Hired staff around the country to ensure that the AAC is vibrant in your backyard. These Regional Coordinators regularly connect with Members by hosting local events, conservation projects, and more. Sarah Garlick supports the Northeast Region from North Conway, NH. • Expanded its Member benefits to include rescue insurance, gym and gear discounts, and new and improved places for climbers to stay, such as the rebuilt Snowbird Hut in Alaska and the new AAC Clubhouse in Kathmandu, Nepal. working with local conservation and climbing organizations to break ground this year on a Climbers’ Campground with amenities walking distance from popular crags. user-friendly and attractive online space. • And in 2012, the Club will break ground on a new Climbers’ Campground with easy access to climbing in New York’s Shawangunks. To encourage younger climbers to attend this gathering of the generations, those 28 and younger may purchase tickets at half price. The American Alpine Club provides knowledge and inspiration, conservation and advocacy, and logistical support for the climbing community. The AAC advocates for American climbers domestically and around the world; provides grants and volunteer opportunities to protect and conserve the places we climb; hosts local and national climbing festivals and events; publishes two of the world’s most sought-after climbing annuals, The American Alpine Journal and Accidents in North American Mountaineering; cares for the world’s leading climbing library and country’s leading mountaineering museum; manages the Grand Teton Climbers’ Ranch as part of a larger lodging network for climbers; and annually gives $80,000+ toward climbing, conservation, and research grants to adventurers who travel the world. Learn about additional programs and become a member at americanalpineclub.org. Join the AAC’s online community at facebook.com/americanalpineclub. When we found this online, Andrew had to put his headphones in. He couldn't even stand the parody version of this song. 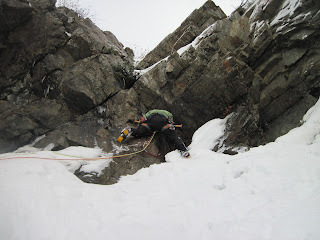 The following is a short article from Mike Pond about the absolutely awesome ice climbing found in the Ouray Ice Park. But before you read it, we wanted to let you know that we have a SALE running on all courses and private trips in Ouray this season. and get a 20% discount. I am the AAI instructor/guide for Ouray, Colorado. I’ve climbed in a lot of places, and have never seen anything that quite matches up to the Ouray Ice Park. While there is a lot of great ice and mixed routes in the Ouray backcountry, the ice park is where it’s at for honing your winter climbing skills. The park’s history is interesting in itself, which I’ll leave for another day. It’s great to be back for another winter of ice and mixed climbing here in Colorado! The Ouray Ice Park from the entrance. Just one piece of the mile-long ice playground. The stats: Ouray, Colorado. Elevation 7800 ft. Population 800. A charming small mountain town with (developed) hot springs and a disproportionate amount of ice and mixed climbers given its small stature. The Ouray Ice Park is right on the edge of town. Literally, I walk ten minutes from my house and I am in the park. The park itself is a slot canyon that has about one mile of ice climbing in it. How, you may ask, would ice form for a continuous mile? Well, the good people here in Ouray have a sort of mad scientist approach to ice climbing and have installed a piping system on the canyon rim, from which hoses spray water every night. This water flows over terrain of various angles to create a mega playground for ice climbers. It is truly incredible. There are hundreds of ice climbs and dozens of mixed climbs. There is literally something for everyone here, with low-angle practice walls, fat flows, moderate-angle flows, steep flows, pillars, daggers, bolted mixed climbs from M6 (similar to 5.7) to M 10 (like 5.12), and even a few trad mixed climbs. Oh yeah. It is one of the best places in the world to learn how to climb ice and mixed. And, with an extensive backcountry at your doorstep, there is heaps of alpine climbing and longer ice routes to apply the skills learned in the park. Climbing a fat, blue ice flow. Oh, Colorado. Despite some wacky unseasonably warm weather that’s been hitting the country, the ice is happening here, full force. Even when it’s warm weather in the medium-high country, the ice park itself never seems to get much above freezing. Literally, yesterday I was in the backcountry in a protected, sun-drenched area in a t-shirt for most of the day. Talking with other climbers, it was perfectly chilly down in the park. While this may seem intimidating, it’s not bad down there. It’s well protected from high winds and inclement weather (it’s a slot canyon) and hey, freezing is good for ice! And ice, after all, is what we’re here for. The ice park is a great place to learn how to mixed climb, combining rock and ice in the same pitch. The author getting psyched for the next lead. As the season progresses, I'll plan on adding more photos, videos, and stories from one of the country's best ice climbing areas in its prime season. Happy winter! With the recent dump of snow we've received over the past week, I thought this first video is fitting. I started snowboarding as a teen in Wyoming, and even taught lessons at a resort in Colorado. In the last few years I started to Tele, and even more recently I have stepped into the world of surfing. So when I saw this video, my jaw dropped and I knew I had to share it. For those of you who spend the winters in the gym training, how about trying this at your next trip to the rock gym - to the top in a little more than 6 seconds?!?! Happy Winter. I am Mike Pond. I’ve been a guide for AAI for four years now, and am going to unabashedly use our blog to get the word out for a research study I am doing. I am a graduate student at Ohio University. Last year, I put the nomadic climbing-guiding life to the side to pursue a master’s degree at OU. This year I am completing my thesis (while climbing and guiding in the Southwest – currently in Ouray, CO enjoying the stellar ice. But I digress). The study is called “Investigating Climbing as a Spiritual Experience.” A graduate-level thesis is basically a shorter version of a Ph.D., and I am using my experience as a climber and guide to help out the research. There are three basic components of this study: background, research, and write-up. So far, I’ve looked through some of the popular climbing literature out there that has spiritual elements in it, as well as scholarly religious works that are relevant to the topic. I finished this part last spring, and am now on step two – doing the research. Research in this field is quite “soft” compared to, say, biology or astrophysics. There’s no double-blind pill popping or lab coats involved, just a bunch of climbers (which seems to be the case in every part of my life these days). Here’s where I need your help! I am looking for interview participants for my study. If climbing is somehow spiritual for you, I would love to interview you. There are two criteria: you must be a climber (if you have gone on one of our courses or expeditions, you’ve got this covered), and climbing must be somehow spiritual for you. I have had a number of people ask what I mean by “spiritual.” I am going to play the standard psychologist trick and ask you, “what do you mean by spiritual?” If climbing is spiritual as it fits into your definition of spirituality, that will work. As a side note, one of the goals of this study is to find out what climbers’ definitions of spirituality are, and how climbing fits into that, so I want to influence responses as little as possible. Some fine print: You must be 18 years of age or older. You will not be compensated for your time. There are no risks, and no benefits of participating (other than making my day). Your personal information (name, employer, location) will be kept confidential. I’ll make sure to put something out in the AAI blog when I’m done (est. Fall, 2012). Thanks in advance for your help, and have a great winter season! If you’re interested, or have any questions, please email me at mike.pond [at] gmail.com or call/email AAI, they’ll surely send you my way. Thank you very much! Okay, so I'm going to wag my finger a little bit in this blog post. Here it goes. Don't place bolts unless you know what you're doing! There really is only one way to learn to place bolts correctly. That is to find a mentor who has done a lot of bolt placement -- or even better, bolt replacement -- and learn from that person. The problem with placing bolts without understanding the different issues behind such a process is that with bolt failure a person could easily be hurt or killed. When you place bolts, you are essentially placing gear for someone else...so that gear has to be good. Forty kilograms is approximately 90lbs. This is akin to nothing in a climbing setting. It appears that the person who placed these bolts, placed them in a form of very weak sandstone. He used expansion bolts instead of glue-ins, which are considered standard equipment in Australia's Blue Mountains, Nowra, and Mittagong climbing areas. The expansion bolts, as you've seen in the video, rip out very easily. The Red Rock program is already ramping up for the spring climbing season. Red Rock Rendezvous is just around the corner and we currently have a sale on for those who would like to book climbing trips or courses the week before or the week after the event! Give us a call to find out more! 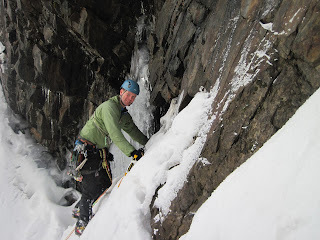 Will Gadd tackles Roman Candle, a nice M8 in Hyalite with a short pillar of ice at the base. "What could possibly go wrong?" asks Will. We just got word that AAI Guide Ian McEleney and the participants on his Winter Mountaineering program successfully summitted Mount Whitney(14,505'). Ian stated that it was extremely cold and that he was forced to wear his puffy jacket all day. Some of the members of the Winter Mountaineering program will remain with Ian for the next two days. Tomorrow they will start a two day ice climbing intensive in the Eastern Sierra. You can purchase a Jetboil hanging kit for $30, and it will come with a fancy triangle base and strong steel cable and a bunch of other stuff that is only used for hanging your Jetboil and extra weight. Or, you could go to the hardware store and buy a $3 hose clamp and 50 cents worth of cord and make one yourself that is more simple. The nice thing about the homemade kit, is that it never leaves your Jetboil, it's lighter weight, and the materials used to make it could be used for other repair needs if necessary. I believe the photo is explanation enough for how to make this yourself. When I'm in the alpine, light is almost always right. The skinniest Spectra slings out there (the middle white sling in the photo below) absorb the least amount of water and are the lightest, so most of my alpine-draws are made up of them. However, sometimes I'm nervous about abrasion over a particularly sharp rock, and that's when I like to use more of a nylon-Spectra blend (the purple sling at the bottom). These slings are a little thicker, yet are still lighter than full nylon slings and don't absorb as much water as nylon slings. Lastly, I do like to bring one double length nylon sling for anchors. When you're in the alpine, things are often wet or frozen, and you may be wearing gloves. Trying to remove an overhand knot in a 10mm Spectra that has been weighted at an anchor can be next to impossible with gloves on. 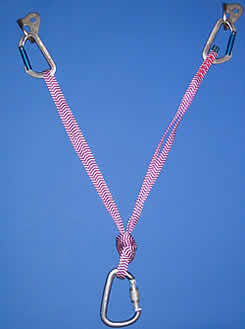 Although the thicker (9/16" - 1") nylon cord is heavier, it is much, much easier to untie after being weighted. This additional weight of one (1) nylon sling is worth the time I save at belay transitions and the warmth I maintain by being able to keep my gloves on. While I mostly like to keep my rack as simple and uniform as possible, I do like incorporating one or two of the thicker slings for the purposes I mentioned above. Having options can be nice sometimes. Here's a funny take on your standard ski movie: it's called the Tilt/Shift affect. This camera trick makes everything look like a tiny toy set. Here's another good one - digging the soundtrack for this too! And just in case these "Tiny Mode" clips aren't your cup of tea, here's some Johnny Collinson ripping it up in Greenland. VIDEO PROFILE: BD athlete Johnny Collinson skiing in Greenland from Black Diamond Equipment on Vimeo. But maybe, just maybe you are one of those folks who can't stand winter or the snow (to each their own). Maybe you are yearning for warmer days and being out on some rock. Well, here's a little bit of Stoke for you. Hopefully this will help feed your need until it's time for some rock. Adventure isn't always about the Summit! Last month I had the opportunity to go out and take a look at an area with a lot of ice flows that hasn't yet seen much action. According to my partners, they had went into this particular area two years ago and found a tremendous amount of ice. There were big blue flows everywhere. Well, we went in a bit on the early side and didn't find those flows. A series of ice flows on Hall Peak that were not yet climbable. Nearly a decade ago I wrote about Hall Peak in Washington Ice: A Climbing Guide. There is one moderate route in the area called Silverton's Sickle. At the time of the writing, I had not been into the peak. I got the beta from the gentlemen who completed the first ascent of the line. My friends completed the sickle in 2009 and then proceeded to climb a handful of first ascents in the horseshoe basin above the route. Based on what we saw on our recent trip into the area, they weren't lying. The lines just needed a bit more time. We were a big group. There were six of us, which isn't always the best situation for making good choices in the alpine. But we did come to a group decision. We decided that if the ice climbs weren't in, then maybe we should try to climb Hall Peak itself. One of my partners decided that he wanted to drop down the other side of the col toward the northeast face of the mountain. The face looked absolutely stellar. It was totally climbable...but maybe not totally protectable. Most of the face was covered in a couple of inches of ice. which would be fine for movement, but not necessarily fine for building anchors. And definitely not fine for a big team of six. We all dropped down and skirted below the face and climbed up a steep couloir, where it looked like there might be a way to attain the north ridge at a low saddle. There were two options to try. The first was to ascend a steep styrofoam snow slope. Both myself and one of the other climbers tried to do this, but found that the seventy-degree snow topped out on power covered slabs with no protection. Looking up the slope. We knew that there would be no pro until the trees. Unfortunately, the styrofoam ice ran out about twenty-feet below the trees, replaced by sugar snow on a slab. Another view of the steep terrain above the couloir. After retreating from this slope, we tried to climb through the top of the gully. There we found a steep rock step that was quite difficult to climb through. Both I and one of the other climbers tried this as well. The author approaching the rock step. The author - about to start the rock step. it slipped right out. I couldn't get into a good position to chip the ice out. The second climber was ultimately able to chip out enough ice to do some direct aid, but time was running short and we had to retreat. We have recently had an individual create a video for us to promote our AMTL series. Every time we watch it we think it's cool, but are having a harder and harder time talking about it critically. American Alpine Institute from John Grace on Vimeo. Left Photo: Board hook template placed on top sheet for punching and drilling. Left: Countersinking the holes in the base for the board hook bolts. Right: Board hook bolts countersunk into the base. Left: Split in tour mode. Right: Put together in board mode. Voile split kits and splitboard climbing skins can be purchased from the AAI Equipment Shop. Additionally, the shop rents splitboards: http://www.guideschoice.com.